Our home-schooled children have been developing a wide range of art and design techniques in using colour and pattern, using watercolours to create a background. Firstly, the children used a small piece of paper to try out the watercolours. 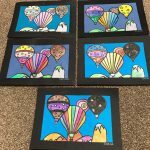 Then they used the skills to colour and create a picture of a hot air balloon. From the above activity the children were able to use different techniques to show a range of textures. They were also able to apply the techniques to a given image and identify and discuss the reasons for selecting the appropriate technique.